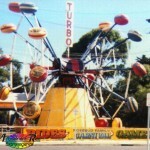 My all time favourite ride, the Turbo, was manufactured by Chance in 1970 in collaboration with Gerry Barber who had earlier designed the Radar. Chance manufactured 23 Turbo’s before production ceased in 1976. Turbo is now extremely rare with very few working units found only in USA and Australia. At the time of Turbo’s premiere it sold for around USD$75,000 but as with many other rides who had ‘earned their money back’ all but 3 of the 23 built are now neglected piles of rust in sheds and backyards. The Turbo is superb to watch and even better to ride. The ride consists of two giant wheels resembling spider web structures. On each of these wheels are 10 circular cages attached at a slight angle. (each cage holds 2 adults or 3 children). Each wheel turns while both rotate around the base of the ride in the opposite direction. The result of these combined movements is a thrill seeker’s dream. The cages randomly spin around at varied angles flipping upside down, sideways or swooping riders face-down towards the ground – just inches away from it. The ride moves with smooth, random (and very fast) style unmatched by any other in my opinion. Ingeniously, the whole ride fits on two 40ft trailers – one for the cages, the second for the entire tower and wheel structure. Inside the base is an arched trailer (wheels included) that is hinged hydraulically bearing the two spider web wheels that fold out like umbrellas . The ride can be set up in roughly 6 hours with two people. 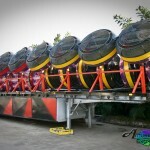 Until ten years ago Australia had 3 working versions of the ride; all travelling, in very good condition. Unfortunately one was in a freight train accident in 1996 where some of the cages were smashed beyond repair; another was sold to China while the third is a work-in-progress set to re-appear in 2011. The remaining idle units can be found only in North America, and as of November 2010, one of these is being refurbished by USA Showman, Jerry Baque. I rode one of these when I was around 6 yrs old (~1972). There used to be one at Springlake Amusement Park near Oklahoma City. I remember being very frightened because it was the first “upside down” ride I had ever been on. I have wondered why I haven’t seen this ride since. Does anyone remember this ride at Darling Harbour in Sydney, Aust around 90-91? There were a few rides down there for a few years before all those nightclubs and restaurants were built. I was too small to ride it at the time but I remember it well…blue and yellow colours..also the UFO was there and the Tumble bug from Luna Park.. I rode the turbo a couple of times during the ’70’s at the Kansas State Fair in Hutchinson, KS. The Turbo was with the Royal American Carnivals. I miss that ride. Chance should bring it back! I remember watching this ride in action in 1974 in Melbourne, Australia when I was six. My older siblings were allowed to ride it but I was too little at the time. When I was 13 I rode it 8 times in a row, and many times in later years. Absolutely loved it. There is no way I would ever go on it now! I always associated thie ride with the Zipper. They came to Aus at the same time. There are plenty of Zippers around, but hardly any turbos. It’s not even on Wikipedia. I am going to make a page in its honour! There was one at the Royal Melbourne Show a few years ago, but have not seen one since. We canNOT let this ride become extinct! i would love to ride that! Good on you Elwin. Knowing how well you present your other rides,it will surely be an immaculate restoration. We can hardly wait for it to be on the road again! When can we expect this back on the road in Oz? It’s been SO long since we’ve seen it!!! What do you mean you are re-constructing it? making another turbo or a new version? or you mean a model one? Hey i saw the turbo the other day in west sydney…it was being tested it looked like. Only one wheel was painted and the other was white. Looks like they are re-vamping it or something. Looked like it was going really fast. Its good they are finally starting it again! Probably getting ready for this years easter show i would say!! Hi didnt get any fotos yet but yeh the Turbo is currently working and in Windsor..just north west of sydney… its currenly beautiful and in a blue theme of colours..also the name has been changed from turbo to charged up!!! cant wait till it goes to the easter show this year..hopefully!!! Reithoffer shows had a turbo in the early seventies. I remember one teardown when the tower got stuck coming down. It was a very cool ride to set up and tear down. 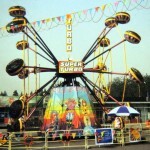 I Rode this Turbo at the San Mateo County Fair back in the 70’s.It was the best ride. Me and my best friend saved up money all year so when the fair came we would ride the turbo as much as we could. I remember the Turbo from the Canadian National Exhibition in Toronto back in the 1970’s. It was definitely the best ride at the fair. I have a cousin (15 or so at the time) who could not be scared by ANY ride. But when she rode the Turbo she screamed and cried for mercy! It was amazing how the angles changed as the ride operated. I can still remember being face down seemingly inches from the ground against the grate and then shooting straight up into the air. The ride was also great to watch from the sidelines – seemed lik cages were going all over the space – very nice. The turbo here is australia only weeks till its out and about on the road. Mildura Victoria may be its first show. then doing dandenong, taralgon if not. it will be at there 2011/2012 christmas carnival. HI I set up and tore down a turbo for Sam Johnston for three years Back in the 1990. They had one of the first one made. It is in Los Angles beening redone. They sold it to a show their. Will look for any old pictures. I rememember riding The Turbo at the Boardwalk in Wildwood, NJ in 1976-1977. It was a memorable ride- there were no belts in the cages- just a padded bar that you could cling to if you were strong enough. I would love to ride it again. 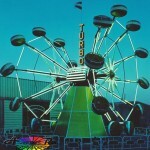 The Turbo was at the Anderson, Indiana Free Fair in the 1970’s. Degeller’s Magic Midway had the midway contract throughout the 60’s and 70’s and ususally setup about 20 big rides as well as many kiddie rides. If I remember correctly they contracted the Turbo from Reithoffer Shows for that season. The Turbo was the wildest and most fun ride I ever rode and I wish they were still around. anyone who knows where can i buy 10 turbo cages??? 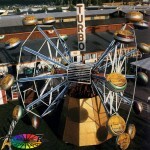 I have seen this ride,TURBO, at the New Mexico State Fair in 1971 & 1972. I have recently talked with bells, regarding the Australian turbo. Hopefully it will be ready to go very soon! Keep your eyes out for this one, and ride one of the best rides ever made! I ran the Turbo on Marine Pier in Wildwood during the summer of 1976; the following summer Marine Pier became Mariners Landing. I was 19 years old at the time and lived with two other fellas from Pittsburgh. I made a $100 in extra money from all the change that fell from people’s pockets. We filled the gaps between the boards with rope so that we captured all the change. I worked with an retired gentleman named Ted. Our favorite trick was to offer to hold people’s cameras when they were on the ride. We would then take a photo of each other giving the finger to the camera. Imagine the laughs when these people developed their film a few weeks later when they returned home to Bayonne, Camden or Philly. Boy was it fun! By the time Bells get it ready and operating ill be 90. When will they start to move quicker. I cant wait anymore for the Turbo!! I remember seeing a TURBO at the Arkansas State Fair in Little Rock, AR, back in the early 1970’s ( probably 1972 ). The ride fascinated me and glad to see there are others out there that remember this ride. the ex australian turbo just sold on used rides – currently in china- does anyone know where its going?? back to OZ??? Reithoffer Shows still has there old turbo at one of there winter quarters in Abbeville S.C. The China Turbo that got sold to Playland was ultimately scrapped later, can’t remember when, Bell’s turbo in Australia is almost ready to run, it’s going through aesthetic phases, and a few more tubs are needed. What about the rotor ride it is the original hellhole I seen one in existence in my 28 years doing carnivals ???? With Chance starting to make Zippers again, I wonder how long it will be until we see the turbo make a comeback? I saw one of these back in the mid-80’s in Oklahoma City when I was 13. It was in the parking lot of a strip mall at SW 74th & Penn; one of those traveling carnivals. I’ll never forget it. 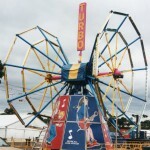 Sadly, I didn’t get to attend the carnival so I never got the chance to ride the infamous Turbo! There’s one in operation in Delicias, Chihuahua in Mexico. At a park called DIF. I contacted a carnival company here in Mexico that used to operate one of these in the mid 90s to ask what they did to it. They told me they sold it in 2000 but sadly after that it was involved in an accident and didnt operate until 2009 when it was restored. I have a photo to prove it. Anyway the owner of the company informed me of this other turbo still operating in a park so I’ll inb stagnate more cause that would make 5 turbos fully operational from the 23 manufactured. Oh and by the way, some guy posted a coment on YouTube on a video of a turbo in operation he said he owns one but doesn’t knows how to assemble it and was asking for a user manual but the account that posted the coment has been deleted and there’s. O way to contact him. I loved riding the Turbo – one of my all-time favourite rides!!!! 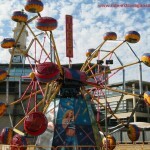 It was usually not far from the Zipper at the Brisbane Exhibition Show (the Ekka). I remember riding one time in the mid 80’s and everything had flown out of my pockets but still safe in the cage.